Ada Braille signs are essential for making sure that your bathrooms are easily accessible to all members of the public. These easy-to-decipher signs will help customers differentiate between male, female and handicap accessible restrooms. Braille will also allow individuals with visual limitations to understand and read restroom signs. It is crucial for businesses to keep up with ADA Compliance as to be able to accommodate our fellow citizens. Tactile Braille signs are becoming more customary in locations such as fitness areas, break rooms, and waiting rooms. Our stock of Tactile Braille signs are traditionally in conjunction with restroom locations but can be used for multiple applications. Adhesive backed foam strips are provided with each sign for easy and quick installation. Most signs we offer are rounded corners and have polished edging. Signs offer Clear Symbols and Depictions. Other options available: Color, Size, etc. We also offer a Pressure Sensitive ADA (Sticker). Our signs meet regulations for ADA Compliance Standards. With these features, Customers with limited vision will also be able to find the bathroom more easily with ADA Tactile Braille signs. Please see details below to help determine location placement for signs. It is important to note the location of where the sign needs to be placed to be within ADA Compliance. Signage will need to be centered at 60” from Finished Floor/Ground. Signage shall be placed on same wall as latch for restroom. 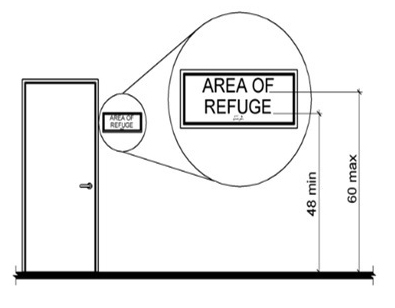 A clearance area of 18”x18” is needed to avoid blocking access to sign. We’ve been helping maintain bathrooms since 1970 by providing the best hardware and accessories including ADA Tactile Braille signs. With an increased demand to upgrade and comply with ADA Regulations, we are here to help meet your needs. Please feel free to contact us with any questions you might have.